Adobong Tahong is one alternative method of cooking mussels. Frozen mussels are usually available in most part of the word but sometimes we Pinoys are hesitant on buying them for the reasons that we are used to eating them fresh from the shells. Today I will share to you my version of adobong tahong. I used frozen mussels but fresh one is fine as long as the shells are removed. 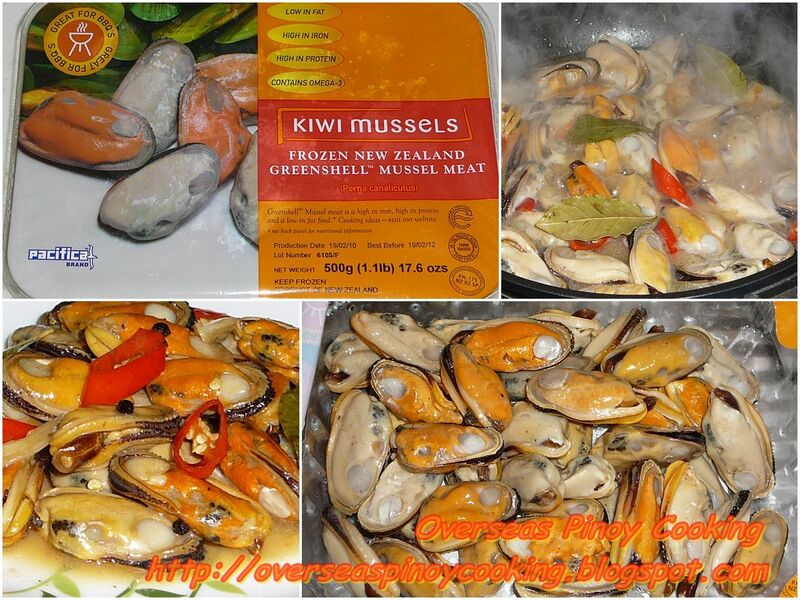 The only set back is when mussels are overcooked they tend to be rubbery, so avoid cooking them to long. But for adobong tahong we have to settle for the little rubbery texture, for me I don’t mind as long as they are not that bad and its best to have a little chewiness on them. It may be a bit troublesome to find good quality of mussels in Metro Manila but sometimes you could find them at big supermarkets. Here is the recipe of my Adobong Tahong. In a sauce pan heat the cooking oil, suttee garlic and ginger until fragrant. Add in the mussels, peppercorns and bay leaf, stir cook for 1 to 2 minutes. Add in vinegar, soy sauce and red chili. Let simmer for 5 to 10 minutes or until most of the liquid has evaporated stirring occasionally. Season with salt to taste. Serve with rice. Wow, are you in New Zealand?